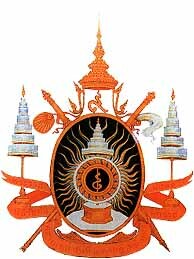 Name: The Royal Ceremonial Emblem on the Grand Celebrations of the Reign, marking the longest reign in the Thai history. Definition: The Royal Seal, as an eight-sided fig-wood royal throne under the seven-tiered royal umbrella. The royal discus with flames is featured on the throne, with the symbol of auspices in the middle of the discus, symbolizing His Majesty the King's great power of kindness and benevolence that reaches all directions to protect his subjects. The five royal regalia and the Thai numeral 9 signify the longest and most prosperous of the 9th Reign, the longest reigning monarch in Thai history.